I know I said I was going to talk about mixing bowls in the next part of this series, but I lied. 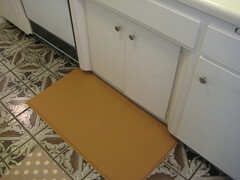 Instead, I’m going to tell you about my love affair with my GelPro kitchen floor mat. My mom bought one for my parents’ house years ago at Bed, Bath and Beyond, and let me tell you, after baking while standing on my mom’s GelPro mat, the foam mat I bought at Target for my kitchen doesn’t even compare. Since I’m often at my parents’ house for holidays, much of my time there is spent standing in the kitchen, and the GelPro mat is a necessity. When my parents remodeled their kitchen (double convection oven! island! huge deep sink! additional sink! ), they chose stone floors which are definitely not the most comfortable floor to stand on for hours at a time. And to make matters worse, I recently developed sciatica (which I can tell you, is incredibly painful, second only to my post-tonsillectomy pain three years ago) which is aggravated by standing on hard surfaces for long periods of time. When I stand on the GelPro mat, my back and legs are happy! So, when GelPro offered me a mat (I chose the striated style in khaki) for my own apartment, I was incredibly excited–I have 1970s ceramic tile floors which are not only ugly, but horrid to stand on. Plus, I was on my third foam mat (they get grubby and can’t be wiped clean) and was ready to do anything to avoid another doctor visit and potential MRI. Now I can’t imagine not having the GelPro mat in my kitchen. In fact, I’m now totally spoiled and wish I had one in front of my stove too. (So what if I have a tiny galley kitchen?) In the meantime, I’m surviving by moving the mat to whichever side of the kitchen I’m currently working in. Sure beats back pain. Wish you had a GelPro mat too? Here’s your change to win one! Because the folks at GelPro are so nice, they are giving away any 20″ x 36″ GelPro mat to one Nosh With Me reader! To enter, leave a comment telling me how you first discovered my blog, and what, if anything, you’ve made from it. Contest ends at 11:59 p.m. EST on Sunday, June 13, 2010. One winner will be selected at random shortly thereafter and contacted by email. Please note this contest is only open to residents of the U.S. and Canada. I found you through Smitten Kitchen and the first recipe I made was the World Peace Cookies. Yum! I discovered your blog, which I love by the way, through a link on the Cupcake Bakeshop by Chockylit blog. My favorite thing that I have made from your recipes is the sublime Strawberry Buttermilk Cake, which I made with freshly picked blueberries rather than strawberries. I also made the Chocolate Chip Scones, which are my new favorite tea-time treat. I knew about this blog from your personal blog! Because I tend to stick to the same things over and over again, and rarely try anything new (I know! Shame on me! ), I don’t think I’ve ever baked any of your recipes… Forgive me! Oh goodness, i can’t even remember where i first found your blog, i’ve been following for such a long time. My favorite were the homemade oreos 🙂 yum yum!! I’ve been reading your blog for about a year. Not sure how I first found you, maybe from Smitten Kitchen? Thanks for the chance to win. I’ve always wanted one of those gel mats. I don’t remember where I found your blog, but I do remember the salted butter caramels! I want that mat. I just wait for you to make me stuff. Buttermilk cupcakes with praline frosting is on my list to make very soon! I started reading Nosh after my sister suggested. Ahh! I don’t remember! It was at least 6 months ago. I am addicted to reading food blogs, I found yours somehow, probably from a link on someone else’s, and when I read through your recipes, I saw several I wanted to make! I don’t remember if I ever did though… That happens. I think I’ll have to go look at your archives for something to make right now though! I have no idea how I found your blog honestly. I get lost in blogland often clicking links and clicking links. I did make your matzo brittle for passover. That stuff is like crack. SO GOOD. Love you blog and my aches and pains would by very happy for the relief!!! Maybe if I got a little more sleep, I could remember how I found your blog, but I know it was something related to Jewish baking. I might bet that it was a search for “Hamentaschen filling”…but don’t quote me on that! I am on my feet so much, I need a gel floor! I actually have one by the sink and it is *amazing*, but I would love one by my prep area, that’s where I spend most of my time. I think I found your site from a link on JustJenn’s blog. I’ve made countless things from your blog! brownies, cupcakes, breads… you name it! Although favorites have to be the brown sugar shortbread and brown sugar cookies. I think I found Nosh with me from a Facebook ad. Enticed by the picture, I became hooked on reading your inspiring recipies. I have damage in my spine from L4 to S1, so I am really entrigued by your review of the GelPro. My back and my own nasty kitchen floors keep me out of the kitchen too…something to think about for sure! I discovered your blog when I met you! And I have made lots of things from here, but probably liked best the brown sugar shortbread. YUM. And I really want a gel pro mat and keep looking longingly at them when I’m at BB&B. I found you from a reference in another foodie blog, but I don’t remember which one. I understand the need for such a mat – and the foam ones are not doing the trick. I found your blog on a friends page on facebook, everything ive seen looks yummy but have yet to make any of it. Don’t really remember how I discovered your blog- just glad that I did! I have made quite a few things from your recipe list including the “baked” brownies, which are amazing and prompted me to go out and buy the book ( which was definitely worth it!) Thanks! Your brown sugar shortbread is one of my (and my friends’) favorites! Thanks for sharing such a delicious recipe. Think I first found your blog through Smitten Kitchen. o.m.g…this is a GREAT giveaway! i have been following your blog for a little over a year so i have tried LOTS of your recipes including chocolate chip peanut butter cookies and most recently a pound cake. mmmm. I found your blog when I was at the Adventures In The Kitchen blog. She reads you each day. I have made the Big, Fat, Chewy Chocolate Chip Cookies which were delicious. I don’t remember how I found your blog- pretty sure it was linked on someone else’s page, but I love it! I’m excited about the GelPro mat. I’ve been wanting to get one for a long time! The GelPro mats look great! I’m pretty sure I found your blog through Smitten Kitchen when I was looking Hamantaschen recipes. I made your apricot filling and it was delicious! I also enjoyed your Low(er) Fat Oatmeal Chocolate Chip cookies! I don’t remember how I found your blog but I do know that I have read your blog for a couple of years and haven’t regretted one minute spent reading and drooling over your recipes. Definitely found your blog through Chockylit years ago! Love the low and low(er) fat recipes, which are always great for satisfying my need to bake without increasing the collective mass of the household! Ha ha… I cannot for the life of me remember how I found your blog. I think it may have been through another cooking blog… or a google search involving the term “salted caramel”. All I know is that once I got here I clicked the “bookmark” and have been checking in weekly even since. I found you through a link with Smitten Kitchen! I’m pretty sure I found you through Smitten Kitchen. My favorite recipe HAS to be the homemade oreos. SOOOOO yum! Big fan…I have not yet made anything from the blog, but have had the joy of tasting many of the recipes…the “crack bars” are currently a favorite. I discovered you site while looking for candy corn recipes, which turned out just great. I have used the bagel recipe. It was also great but broke the dough hook on my kitchen aid. There are many recipes I would like to try but they will have to wait until I am back at work or else I will weigh a million pounds. Thank you. I don’t remember what link got me to your blog, but I added you to my blog list long ago. And those are the blogs that I read every day… and then I get carried away and have to see what everyone is reading about and cooking!! I found your site from a cupcake blog, but I don’t remember which one. The most recent thing I’ve made from your site is the flourless chocolate walnut cookies, but I have a long list of “to be made” links from here. I found you from Not Martha .. surfed on through. Working with your salted caramel recipe to see if I can make it into a cake filling … nom nom nom.. It was link to your Brown Sugar Cookies (which are the best sugar cookies ever0. Wow I wish we would’ve had these at the cupcakery I used to work at! We would stand in one spot in front of our mixers for up to 4 hours sometimes!! Hmm… I first came across your blogging when I first started my blog. I was looking for a vanilla cupcake recipe and I made one I found here! I found your site off smitten kitchen! I made the snickerdoodle muffins. LOVE THEM! I have one of the foam mats too (mine is from Home Depot) because I couldn’t afford the gelpro mats but i think they are awesome! I’m also so happy to hear you got one and it’s making your sciatica not so painful in the kitchen. Found your blog looking for Passover recipes. LOVE ur blog and tried many of your recipes. yummy……. I can’t even rememver how I first reached your site. I am always looking for new recipes, espacially baking. I continued to follow noshwithme from that first accidental find. I espacially enjoy comparing your Challah, mandel bread and hamantaschen reipes to mine. I came across your blog a few years ago when I was searching for new recipes – I can’t even remember what now! I was very impressed & bookmarked it in my favorites – I visit once every few weeks & everything I’ve made I make over and over!